This machine is mainly used for pig killing, shackling and bleeding after stunning process. It is composed by machine frame, reducer, chain and receiving chute, etc. Whole machine is made by stainless steel 304, with acid resistance, anticorrosion function; equipped blood receiving chute and waste receiving chute will eleminate cross contamination. ZBHT Slaughtering Machinery Co.,Ltd. manufacturing high-quality Automatic Pig Shackling & Killing Conveyor and supply OEM, ODM service according to your personal requirement. 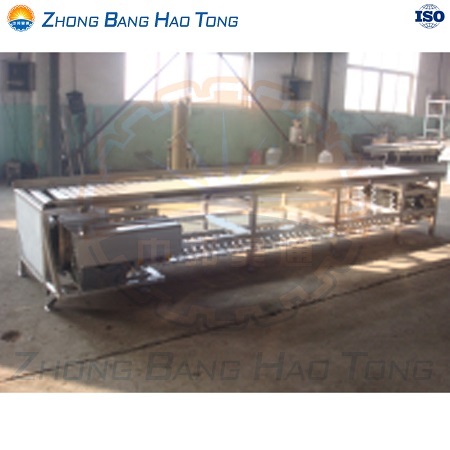 Our Automatic Pig Shackling & Killing Conveyor and other Pig Slaughtering Equipment is not only good in quality but also competitive in price, welcome to inquiry us about the details of Automatic Pig Shackling & Killing Conveyor or other slaughtering machine products and accessory equipment.